02 | March | 2011 | WHAT A FEELING! It’s not quite fair to call The Color of Money a sequel to Robert Rossen’s 1961 film The Hustler. True, the new film picks up the story of the pool-playing shark “Fast” Eddie Felson 25 years later, but The Color of Money presents a completely new, self-contained story, and a fresh style of filmmaking to go with it. We find Felson (Paul Newman returning to the role) as a hustler again, but now he’s hustling cheap booze—selling it to restaurants, encouraging shady deals, getting by. He still cuts a stylish figure, but he may be just a little bored. He hasn’t played pool in years. And he is a man who is ripe for some sort of redemption. 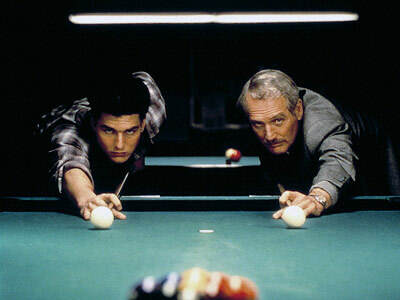 Enter Vincent (Tom Cruise), a hotshot young pool player, with all the right moves and talent to burn. He’s a bit flaky. He wants to play for the sheer joy of playing, which disturbs the materialistic Felson. “You couldn’t find the big time with a road map, kid,” Felson tells Vince, and the old pro decides to take the young phenom on the circuit, to find some action and prepare for a big cleanup. The dialogue is superbly written (by Richard Price, loosely adapting the Walter Tevis novel), and Martin Scorsese’s direction (aided by his brilliant collaborators, editor Thelma Schoonmaker and cinematographer Michael Ballhaus) hurtles the film along at thrilling speed. There are directors who feel that the camera is there to watch a story, and not call attention to itself. Scorsese (Raging Bull, After Hours) is not such a director. His camera swoops, races, caroms and falls, and it captures the intense world of the smoky dives in which the story unreels. Scorsese’s a bit like the pool players; they’ve got their trick shots, why shouldn’t he? There’s a sequence, when Vince is showing off his skills to the nighthawks at a poolroom, Warren Zevon’s “Werewolves of London” is chugging on the soundtrack, and Scorsese’s camera is swirling around it all, that ought to have audiences jumping out of their seats. This directorial energy is excitingly caught by Newman and Cruise. They have that edge that you sometimes see when actors know they are doing something special (as indeed they are). And the film derives a juicy tension from the fact that their characters’ situation is analogous to their standing as actors: Cruise is the hottest thing going, and Newman is now the old lion. Hollywood has wanted to give Newman an Oscar for a few years now; this performance may do the trick. Mastrantonio is a revelation as Carmen, and Helen Shaver does nice atmospheric work, just this side of floozydom, as Felson’s sometime sleeping partner. The Color of Money is the kind of movie that is so inventive and busy, you wonder if it can be sustained. And if the film lets down at any point, it’s in the final 20 minutes or so, when Felson takes an unexpected diversion. This leads to an ending that is thematically satisfying, but slightly less dynamic than the previous two hours of film. But by that time, Scorsese and company have sheer momentum on their side. There’s more to watch in The Color of Money than any ten current movies combined—and you never get the feeling you’ve been hustled. Is The Color of Money considered not quite a full Scorsese movie somehow? It rarely gets mentioned when the people who consider him one of the greatest living directors begin ticking off his signature pictures. But it is very good, and as a star vehicle it’s exemplary. Newman did get his Oscar for the film, a year after an embarrassed Academy awarded him an honorary statue after many misses. Awkward, but earned. You are currently browsing the WHAT A FEELING! blog archives for the day Wednesday, March 2nd, 2011.